Basking in the summer sun not only feels good, but is essential for health! Getting sun allows for vitamin D absorption, also aptly known as the sunshine vitamin. As winter approaches there is a scarcity of direct sunlight influenced by the cover of clouds and snow, but even if there is sun we understandably flee the outdoors when possible and crowd into the warmth of our homes. The good news is that we are not suggesting that you force yourself and your kiddies to stand outside in the cold in order to get some sun, a warmed glass of steamed milk or even some salmon fish stew will help you get the sunshine vitamin without having to leave the warmth of your home! The feeling of something warm and comforting to eat on a cold day is almost as good as the sun on your back in the summer, but both can be equal in the nutrients you get! To get the daily amount of vitamin D your child would normally get from the sun would be equal to approximately 3 cups of milk or a 4oz of salmon. For an adult it would take about 2 glasses of milk and a fillet of salmon in order to reach the daily recommended amount of vitamin D. Given that vitamin D is vital to a healthy immune system, it should definitely be part of your plan to keep the winter colds and flus at bay! 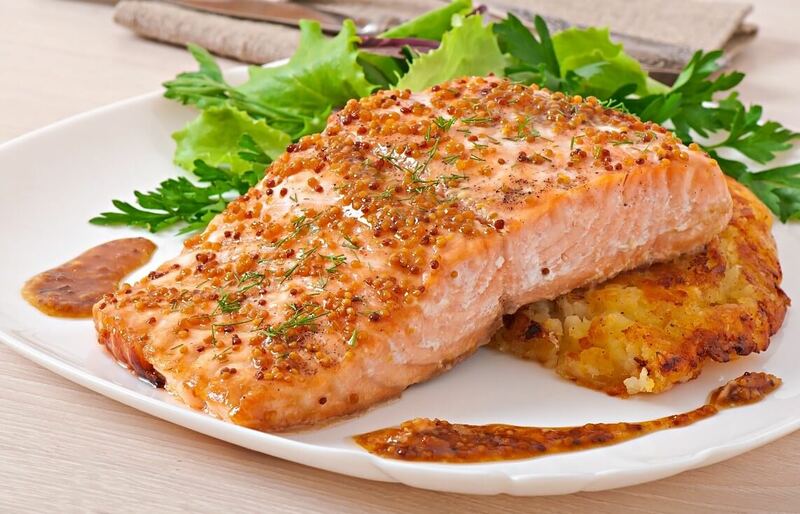 Salmon is a great, healthy source of vitamin D! Getting this fantastic fish into your family’s happy tummies is super easy and a proven success with your kiddies. Attached is our family sized recipe for Maple Dijon Salmon which is delicious and easy to prepare. Enjoy the dish as well as the peace of mind that comes with knowing that although it is not sunny outside, there is a way to clear the clouds with a fish fillet or glass of milk! Brush each salmon fillet with mixture. Even if you can feel the sun on your face, that doesn’t mean you’re getting vitamin D! The sun’s rays that carry it can’t go through glass, so sitting by a window at home or on the way to work in the car won’t cut it! Make time for some outdoor time with your family or make sure to feed them lots of vitamin D rich food this winter! Fatty fish are the best source of vitamin D next to sunlight. Portobello mushrooms are a good source of vitamin D because unlike most mushrooms they are grown in UV light instead of in the dark and thus have the ability to produce this important vitamin! Fortified milk is another wonderful source of vitamin D you can enjoy from the comfort of your home without stepping out into the cold! Hold off on ordering an egg white omelet! The yolks of eggs contain vitamin D so be sure to use the whole egg instead of just the whites next time you cook!